What is the special enticement of an opera gala? These events generally serve as a fundraiser or gathering of donors, but what is the audience draw? Often, the entertainment consists of a “greatest hits” parade of well-known numbers, perhaps as an accent or follow-up to a dinner event. In some examples, the anticipation and focus might even be drawn to political backdrops or the star performer’s parade of dresses. 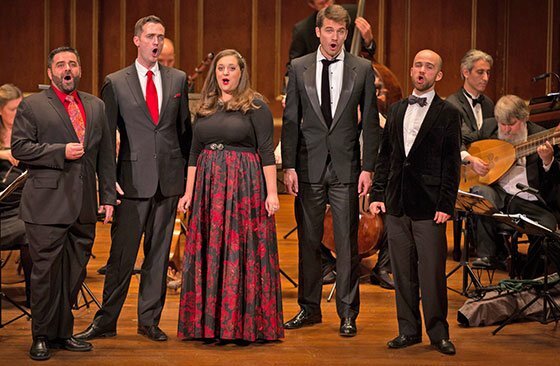 In this case the Boston Early Music Festival’s Chamber Opera Gala on Sunday showcased the organization’s recent seasons via musical flashbacks. This is not to say that eye candy was missing: some very elegant wardrobe examples were on display onstage, and the audience was dressed a cut above the norm. Some of the pre- and post-concert chatter even waxed eloquently about a calendar-enshrined barihunk in the cast. The main attraction, however, was very much the music: collections of scenes and even complete acts from the last five years of BEMF chamber operas. Paul O’Dette and Stephen Stubbs led a thirteen-member instrumental ensemble as nine singers took the stage at Jordan Hall. These excerpts were presented in semi-staged fashion, with no special costumes or set pieces, but ample movement; formal dancing, a source of controversy in some previous productions, was absent from the evening. The afternoon began with the ritornello strains of the Prologue to Monteverdi’s L’Orfeo (1609/1615), an opera that BEMF presented last season. Soprano Amanda Forsythe took up the narrator’s role as the personification of music, promising singing that would charm mortal ears and inflame them with anger, love, and striking accents. This pledge was amply fulfilled—not least by Forsythe herself, whose lustrous tones featured in many of the selections. Her later turn as the grieving Venus in John Blow’s Venus and Adonis (BEMF 2008) was a testament to the dramatic possibilities of recitative; she melted hearts well before the chorus’s following (and excellent) “Mourn for thy Servant”. Other opera selections were drawn from Marc-Antoine Charpentier’s Actéon (BEMF 2008), La Couronne de Fleurs (BEMF 2011), and La Descente d’Orphée aux Enfers (BEMF 2011); Handel’s Acis and Galatea (BEMF 2009); and Purcell’s Dido and Aeneas (BEMF 2010). (Several of these are technically pastorales, but the genre boundaries are inexact.) The Purcell extracts notably did not include the oft-heard “Thy hand, Belinda” and “When I am laid in earth”, instead focusing on the build-up to Aeneas’s sudden departure. There were several strong supporting performances, but the primary attention in this collection of scenes was on the two doomed lovers. Danielle Reutter-Harrah (as Dido) and Douglas Williams (as Aeneas) had excellent on-stage and vocal chemistry, especially in their duet “Behold upon my bending Spear”, with Williams’s regal and stentorian delivery foreshadowing his blasé reaction to being instructed to abandon his love. Teresa Wakim’s dulcet, florid soprano voice was the star of Actéon, with a turn to the deliciously vengeful when her Diane sentenced the unfortunate Actéon (tenor Aaron Sheehan) to death. This was similarly unfortunate for the audience, as Sheehan’s earlier “Amis, les ombres” was delightful. Were this a later sort of opera, Sheehan might have gotten off a pleading cavatina and a desperate cabaletta before turning into a stag, but here the final touch was added by a smug chorus of nymphs. Interspersed was a sweet and engaging interlude of a duet between Amanda Forsythe and mezzo-soprano Thea Lobo (“Loin de ces lieux!”). In an interesting programming twist, Wakim and Sheehan were also cast opposite each other in the following piece, Handel’s Acis and Galatea (a work presented in its entirety). This time, Sheehan’s Acis and Wakim’s Galatea were in love, but Sheehan’s character was no less doomed; the transformation of their sweet duet “The Flocks shall leave the mountain” into a trio by the interjection of Douglas Williams’ bitter and angry Polyphemus was one of the best performances and most memorable musical moments of the evening. Williams, playing a monstrous giant, matched his imposing height with singing that evoked a rippling, rumbling growl. Jason McStoots and Zachary Wilder also contributed strong supporting vocal performances, and Kathryn Montoya’s turn at the sopranino recorder was very well done, especially the unusually orchestrated counterpoint with Williams’ Polyphemus. The program concluded with scenes from two works by Charpentier. Earlier, the opening prologue from Monteverdi’s L’Orfeo had promised a musical glimpse of Orpheus; while no more from Monteverdi’s pen was on offer Sunday, the segments from Charpentier’s score were no less powerful and often more electrifying than that of his Italian counterpart. This was best illustrated in the three-part writing for men’s voices seen with a group of condemned souls, here played by Jesse Blumberg, McStoots, and Wilder. Their two vocal trios—the anguished “Affreux tourments”, describing their imprisonment in Hell, and the aural rapture of “Quelle touchante voix” when they first hear Orpheus – could not have been more different in delivery or composition, and did much to underscore the power of Orpheus’s music. “Quelle touchante voix”, with its close, shimmering harmonies and breathtaking delivery quite overshadowed the rest of the selections. Even the chorus of Furies and a ghostly sinfonia were hard-pressed to follow up that example. Some items could have been improved. It has been repeatedly said that supertitles for the English lyrics would be welcome; to this, I suggest also that supertitles for all of the translations, especially reprises of the text in ensemble pieces, should join them. Although there are many good things to be said about how closely the instrumentalists interlocked with the singers, it is still distracting to see the theorbists mouthing the song lyrics. In terms of placement, the closing scene from La Couronne de Fleurs seemed superfluous, and might have better been placed at the start of the second half, or as a bridge between Acis and Galatea and Orpheus’s descent to the underworld. Overall, though, the performance was splendid as a retrospective of BEMF seasons past and as a showcase of talent. An additional word on the supertitles for this excellent evening (all your suggestions about more extensive supertitles are right on): Apparently, a sense of elegance trumped the practicalities of reading. Within the projected banner, the cursive thin-bodied script (elegant perhaps, but a foolish choice for quick and easy readability) was colored a dark orange or medium brown and projected onto the banner’s pink color. Deep orange on pink! As a result, it was hardly readable from the side-central balcony, third row (or further back, and more central, which I tried after intermission). The house was, unfortunately, only half filled, so one could easily move around to a variety of seats. White printed letters against black, please, or black against white. And a simple, clear font, not cursive curlicues. The audience will forgive the production’s calligraphic ‘lapse’ if it can read the supertitles. Though texts were provided in the program, the houselights were lowered too far for reading the program without strain.